Choi Seol-a, better known by her nickname “Tyeodya,” had never thought she would make her name as a cartoonist until she uploaded her first comic in October 2017. She was not formally taught how to draw cartoons, nor had she decided to become a professional cartoonist before. In her spare time, Choi just doodled some episodes that came straight from her daily life and posted it on her Instagram page. The comics grew into the popular Instagram account @Tyeodya, which has amassed more than 51,000 followers so far. Choi is one of the many amateur cartoonists making use of Instagram to share their comics with audiences. Since February 2017, when Instagram let users upload more than 10 pictures per post, the social media platform has turned into a perfect platform to read short comics. Instead of scrolling down, readers can now swipe the screen to move on to the next frame when reading Instagram comics. As more and more Instagram users start to publish their artworks via the platform, the trend even coined the term “Instatoon,” a compound word for Instagram and cartoons. A search for the word on the platform returns nearly 50,000 posts. Compared to the existing digital comic platforms, such as Naver or Daum Webtoon, Instagram has no barriers to entry. Cartoonists often need to go through fierce competition to debut on the main sections of such sites, but Instagram is open to anyone with an account. This allows ordinary people with regular jobs to become a cartoonist in their spare time. Those cartoonists tend to draw episodes from their works, resulting in Instatoons on a wide variety of subjects. For instance, the Instagram cartoon of flight attendant Daljin (@airliners_toon) illustrates the life of cabin crews, former police officer Pol Jacga (@pol_jacga) introduces episodes spotted in police stations and psychiatrist Owldoc (@owldoc77) gives brief information on mental health. At the same time, some cartoonists use Instagram to raise their voice on social issues through fictional comics. The mega-hit Instatoon “Myeoneul-agi” (@min4rin) garnered massive popularity among Korean women by depicting episodes of newlywed Min Sa-rin, who goes through harsh life as a daughter-in-law in Korea. The story of imaginary figure Lee Ah-ree (@i_iary) criticizes the danger of dating abuse between unmarried couples. Most Instatoons, however, deal with light topics such as real-life stories that many readers can relate to themselves. 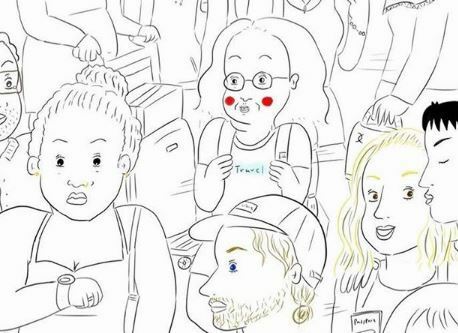 The cartoons of Choi Seol-a tell funny stories that happened while she travelled all around the world, and daily logs of Haddi (@haddi_xox) regularly receives thousands of likes from readers by depicting episodes of her bumming around after quitting a job. Some of the amateur comic artists who are popular on Instagram are recruited by major webtoon platforms. “I had wished to become a professional cartoonist someday, but I gave up (due to the high barriers of Naver of Daum webtoon platforms,)” a cartoonist Bakbaqui, who majored in cartoon animation department at college, told The Korea Herald. Instead, the cartoonist started to upload his short comics on Instagram. After the funny black-and-white cartoons attracted more than 480,000 subscribers, he got contacted by a producer from Korean webtoon platform Lezhin comics. A month later, the comic artist officially made his debut as a professional cartoonist in May. “I was so overwhelmed and thrilled when I got that suggestion,” Bakbaqui recalled. Bakbaqui said there are pros and cons of sharing his cartoons via Instagram and the webtoon platform, respectively. Choi Seol-a also highlighted that she can interact with her fans easily through the social media platform. Choi regularly carries out live streaming on Instagram to meet her readers. About 4,000 to 5,000 fans join the live streaming event, according to Choi. “I started to draw the Instatoon without any expectation (that people would see it.) However, I’m still drawing it as I love to see those supportive reactions from readers,” Choi said.